Parents try to get their children ready to leave the nest. As they grow, the basics are to feed, clothe and shelter them. Education is also expected by our society. Most parents hope that this will lead to higher education which will lead to gainful employment. Some prepare their children for success in these areas better than others. There is a balance between doing everything for your kids where they can’t function on their own and doing nothing for them where they don’t feel supported and loved. Sometimes it feels like walking a tightrope! Children will often attain the educational levels that their parents attain. When they are encouraged, they will exceed them. Unfortunately, the poverty cycle often continues this same pattern. If parents are uneducated or underemployed, this doesn’t often lend to breaking the cycle because the next generation may not be taught to value the things that lead to educational or occupational success. Sometimes when we attain success, we become so enamored with our achievements that we believe we are self-made. If I look at my own life, I remember that I was taught a work-ethic by my parents. I was given an expectation of higher education so that I sought the highest degree for my profession. If my parents had not instilled these in me, I would not be the person I am today. This Sunday, we will continue with the theme, “With What Shall I Come Before the Lord” for the fourth Sunday in Lent. Our lectionary scripture is rather short: Joshua 5:9-12. We are seeing the Israelites move from the desert to the promised land. We know that they were receiving manna for food as they wandered and now they will eat from the what the land will provide. This breaks the cycle of dependence in a way – they will work to feed themselves now. The temptation will be to forget that God has provided for our needs. After several generations, they may forget that God took care of them in their time of need. They may develop a sense of entitlement rather than blessing of the land they have. Of course, we may have that same sense of entitlement without even realizing it. This Sunday we’ll examine that we continue to bring our sense of dependence on God even though God has designed us for independence. This dichotomy is important for us as people of faith for our own happiness but also as we spread this Good News to others! I hope you’ll join us for worship on Sunday! This week Rev. Dr. Sam Powers is traveling with our Youth on the Mission trip, so Rev. Trey Witzel has shared the following article this week while Sam is away. Many of you know that last week were my ordination interviews. 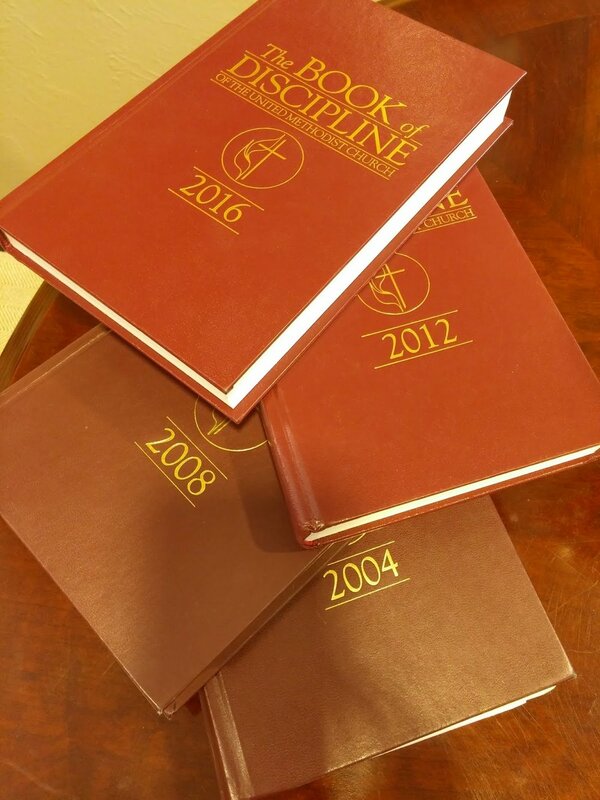 My journey towards ordination started in 2011 during college, and these interviews were the finish line towards being an elder in full connection. And I passed! I will be ordained Wednesday, May 29th at St. Luke’s UMC with the rest of my colleagues, and all of you are invited! You may remember that last year our choir sang during this service, so some of you may have attended an ordination service, but for those of you who haven’t, it is truly a special ceremony. We do not know the time of the service for this year, but last year the special music began at 6:30pm with the service following at 7:00pm. One of the most powerful moments during the service is that when each person being ordained walks up to have the Bishop lay hands on them, attendees in the congregation are invited to stand in support for them. Whether you are able to make the service or not, I know that Edmond First is standing with me. Your support over the past two years has been an immense blessing, and I cannot wait to see where the future takes us. Many have asked if ordination means that I will have to leave—the answer is no! Nothing changes with my appointment status; similar to Sam, I am appointed on a year-by-year basis. Just because I am being ordained does not mean I will automatically be moved. What ordination means is that I will be able to wear a stole, I am guaranteed an appointment (the United Methodist Church’s version of tenure), and I will have fully voting privileges at the Annual Conference level. In a few weeks my daughter Sloane will be born, and then a month later I will be ordained. Serving at and being a part of Edmond First is the perfect backdrop as 2019 shapes up to be one of my most memorable years. Lots of Things are Happening in our Church! Lent is underway as we are looking at the second Sunday in Lent upcoming this weekend. If you haven’t decided on a Lenten discipline, it is never too late to start! I have been writing a devotional each day which includes a reading from the Gospel of Matthew. I would invite you to join me if you haven’t seen it yet. It can be found at http://precedinggrace.blogspot.com/ and you will need to scroll down to start with Day 1. I write each day and a new blog posts before you wake up each morning! The readings are divided so that we will finish the Gospel of Matthew on Easter morning. Our Church and Society Committee met with other groups that feature mission activities. We have a loaded calendar filled with opportunities for those in our church to serve. We are trying to streamline the various months so that we emphasize something in particular each month. For instance, we are emphasizing Skyline Urban Ministry during Lent and are encouraging mission activities to be in some type of ministry with Skyline. Our noisy offering will go to Skyline and our youth will have a Scavenger Hunt for canned goods on April 14. Our adult Sunday school classes will have a contest to see who will bring the most food on April 7. The calendar emphasis will help our church maintain our focus so that we will be as efficient as possible with our outreach. Our Visioning Committee met on Sunday as well and they are working on a Vision Statement. Our mission statement, “Connecting people with God and neighbor” tells why we exist. It focuses on the greatest commandment given by Jesus in Mark 12:28-34. A vision statement often looks at where we would like to go with our identity as a congregation. We will be developing a Sunday school lesson around our church’s mission and vision for each of our adult classes which we are planning on April 28th. Finally, we have a couple of opportunities featuring a new beginning and a farewell on Sunday, March 24th. We will have a baby shower for Trey and Addison Witzel from 1:30 to 3:00 pm. Then from 3 to 5 pm, we will have a farewell for our Youth Minister, Erica Lawrence as this will be her last Sunday. Family issues have arisen that will make it necessary for her to leave us a little earlier than expected. As parents may be wondering the direction of our program, I will be meeting with my fellow parents on Sunday, March 31st at 1:30 pm to discuss our future, both immediate and long-term. This Sunday, I hope that you will join us for worship if you are in town. I am so pleased to be serving such a warm and welcoming church! As we walk through the Lenten Season, one of the ways to grow closer to God is to participate in a Lenten Devotion. Through the years, Senior Pastor Rev. Dr. Sam Powers has written daily devotions walking through various books of the Bible. 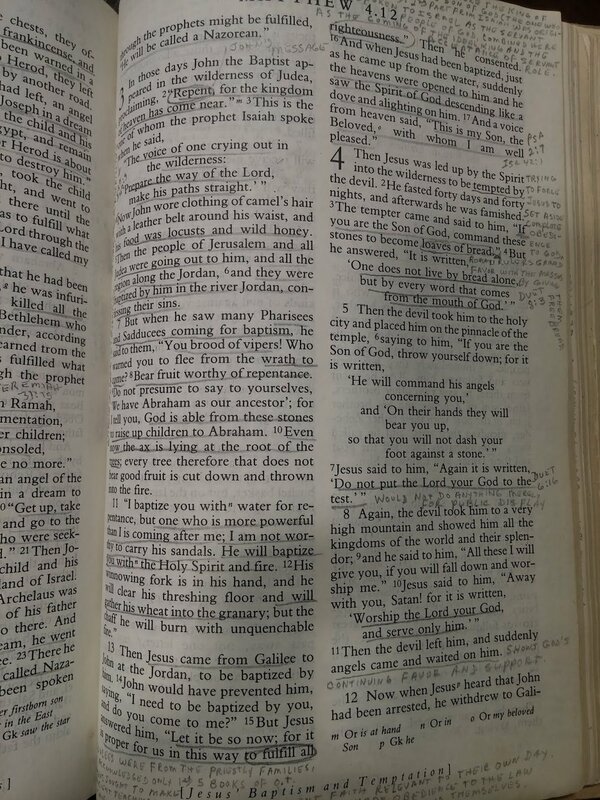 I will be reading through my Dad’s Bible during Lent which has lots of notes on each page as you can see! As United Methodists still try to figure out the depth of their reactions to the special General Conference last month, we have now arrived at the season of Lent in the life of the Church. This is a season preceding Easter which allows us to be introspective in our faith. We ask ourselves how we are doing. What does your walk with Jesus look like? Are you closer to God today or do you wish your faith was deeper? Most Christians profess a need to either pray or read the Bible a little more often than they do - and maybe the “or” should be an “and” if we are truly honest. It would be nice if we could just order a stronger faith on Amazon! One where we didn’t need to read the directions! Some people choose to give things up during Lent. They may have a discipline that includes some kind of fasting from a particular food, beverage or habit. In the past, I’ve given up sweets, hamburgers and one year I even gave up salsa! I did come down sick that year so I’ve not returned to that particular discipline. We do these things because Lent is a season where we think about sacrifice and repentance. Our own sacrifices should remind us of the suffering that Jesus underwent not only on the cross but on his journey to get there. And then, as we think about the incarnational nature of our faith, we are reminded that Jesus is present in the sufferings of other people on this planet. So our fasting from something particular puts us spiritually in solidarity with others who are troubled. These identifications will hopefully lead us to a greater compassion in our lives. I would encourage you to either give something up or to take up a new discipline as we walk in Lent toward Easter. For my own path, I will be blogging daily as I read through the Gospel of Matthew. If you don’t have a discipline yet, why not read through this Gospel with me? I especially encourage people to make their own comments following the blog post and this will be a way for us to engage the scripture together. We will also have several opportunities for the imposition of ashes on Ash Wednesday which is March 6. We will have an independent imposition of ashes at the University of Central Oklahoma’s Y Chapel from 11 am to 1 pm. You may come and receive and we will pray with you during this time. We will also have a service for our younger church members at 6:00 pm in Wesley Hall. This will take about 30 minutes. Finally, we will have a regular worship service in our sanctuary at 7 pm. I will be preaching on 2 Corinthians 5:20-6:10 for the sanctuary service. On Sunday, we will begin a series entitled, “With What Shall I Come Before the Lord?” and we will look at Deuteronomy 26:1-11. I would invite you to join us in worship either in person or online as we seek to deepen our faith together! Rev. Dr. Sam Powers will give a review of General Conference in the sanctuary on Sunday, March 3rd at 1:30 pm. He anticipates that it won’t last more than an hour but will be there to also answer any questions people may have about it. This will help us to process it as a congregation to see what it may mean for the denomination and for our local congregation. I write this anticipating General Conference and by the time it is printed, our conferencing will be complete. I think it is fitting that we are looking toward Transfiguration Sunday in the liturgical calendar year as we try to make sense out of what happened in St. Louis. It is interesting that Transfiguration comes for United Methodists as a bridge between the season following the Epiphany which deals with light and revelation and the season of Lent which encourages repentance and sacrifice. In Luke’s Gospel, this may be a foreshadowing of when the disciples slept as Jesus prays in Gethsemane prior to his betrayal and arrest. Mark and Matthew tell us that they are the same three that witnessed the transfiguration but Luke keeps them anonymous using the more generic term “disciples”. Luke also omits the fact that Jesus found them asleep three times and reports only a single time that Jesus returned to find them napping. What does it mean to be asleep spiritually? And what does it mean to wake up? Often, we can be worn down spiritually. Some may be celebrating but this always leaves others grieving when we have a binary choice. It may be that no one is very happy. Regardless, we remember that the Transfiguration calls us to wake and to bear witness to the glory of Jesus Christ! As we prepare ourselves for repentance and sacrifice once more, may we remember that the glory of Jesus is not our glory. We may point to it but we do not control it or hoard it. But it does rouse us and move us into the world. May that be enough for today. even written legislation that was included in the 2012 edition. Within United Methodism, the General Conference is the only body that can change our doctrine and we debate it through the legislative process. In a few days of this post, we will consider various options for what we might do regarding our stance. Some of the main considerations are the One Church Plan which was approved by the majority of bishops, the Connectional Conference Plan and the Modified Traditional Plan. The sessions will be live streamed if you wish to follow along. The One Church Plan localizes the current doctrine surrounding homosexuality by allowing each clergy person to follow his or her conscience regarding gay weddings. No clergy is currently forced to perform a wedding if he or she chooses not to do so and this would continue. The default for churches is they would continue to disallow gay weddings unless a church takes a vote to change the policy. Annual Conferences (where the clergy pool comes from for local church appointments) would decide whether or not to ordain gay clergy. Churches would still decide whether or not they would receive a gay pastor. Currently, liberal regions of the country ordain gay clergy which is against United Methodist doctrine. The One Church Plan allows a more Libertarian understanding of marriage and ordination since neither practice is considered a sacrament in The United Methodist Church. A person married by the state is not looked upon any differently by our denomination than a person married by a pastor. The Connectional Conference Plan would redistribute the five jurisdictions in the United States into three new jurisdictions that are organized not by geography but by theology concerning LGBT marriage and ordination. There would be a liberal, moderate and conservative jurisdiction. Each annual conference would vote to determine which they would join. Then if a local church did not agree with the annual conference placement, it could also vote to join a different jurisdiction and be placed in the closest geographic vicinity. Under this plan, we could possibly have three different United Methodist churches in Edmond in three different jurisdictions. This plan takes a lot of constitutional amendments to the Book of Discipline which requires a 2/3 majority vote as well as 2/3 ratification by the annual conferences. I do not believe this plan has much chance of passing the needed vote threshold. The Modified Traditional Plan would seek to bring more accountability to the church's current stance. This would be for bishops and clergy alike. Those who are not able to abide by the church's polity would be encouraged to leave the denomination. Labeled the "gracious exit," it would apply to both clergy, churches and even annual conferences. Presumably, they would leave to form another denomination similar in structure but with a more progressive theology. The "Modified" portion of this plan comes from legislation that is seeking to make it compatible with the ruling of the Judicial Council. The gracious exit is written around the idea that those with inclusive theology would leave, taking their property and assets with them. While this group is marketed as the intended target, there are many more conservative churches that would also take this path if it were available. So the unstated consequence of the gracious exit is that there would be many churches who opt to leave which greatly decreases the ministries globally as well as locally. While I do not condone keeping anyone in covenant with me against their will, I don't believe there is a "one size fits all" option for churches seeking to withdraw. Each church is unique. Some have more debt than assets and are barely staying afloat. Others have property that is worth a fortune! Some churches have millions of dollars in endowments. The gracious exit perpetuates the idea of the self-made person or in this case, self-made church. 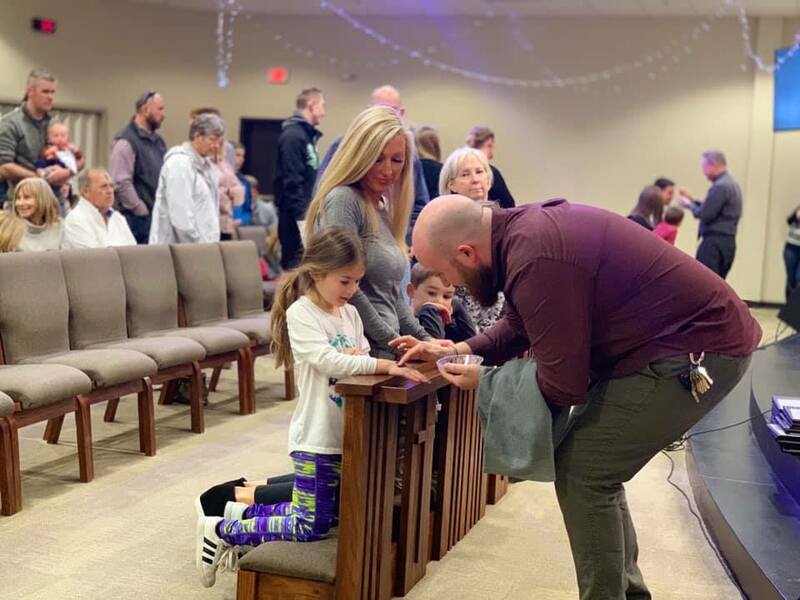 Within a connectional system like our denomination, no church is an island and we may not think about all of the benefits that a local church receives. Our own church has received thousands of dollars in grant money over the past couple of years with more promised in the year to come. Clergy serving these local churches have received spiritual formation and training from seminaries as well as districts and conferences. Our own district provides coaching at no charge to many of our pastors. While there is legislation that would cover pension liabilities, there are many more factors to be considered which is why I favor the current system of review by the Annual Conference Board of Trustees for a church seeking to exit. There are many people who would favor us passing some form of legislation so that we would not continue to wrestle over this issue every four years. While I hate to be the bearer of bad news, no matter what passes (or even if nothing passes and we retain the current language), there will continue to be alternative legislation being put forward every four years. I can guarantee that there will be more legislation surrounding human sexuality at the 2020 General Conference. Churches that leave denominations in order to have greater clarity surrounding this issue continue to find debate. Much of the new wrangling comes from evangelical pastors who have discovered their children to be gay which often changes their stances to become more inclusive. Conflict is a normal part of human relationships and the variety of biblical interpretation was present before the church began. In the Jewish rabbinical tradition of Jesus, there were often schools of thought that emphasized different points in scripture. Early on, there was the idea of Holiness which claimed that God's covenant people should follow certain behavioral guidelines outlined in scripture so that we might be acceptable to God. Another idea is that we serve as a Light to the Nations which means that we are to bring the knowledge of God to people that are not of our tribe. As these ideas have evolved, we continue to see them today. Holiness is more likely espoused by those emphasizing personal holiness or the internal relationship with God. Light to the Nations is more external and includes social holiness or the love of neighbor. Both are biblical and the churches and pastors of our denomination tend to lean on one or the other during the debate over human sexuality. Both are parts of Wesleyan grace as Sanctification tends to be featured in Holiness while Prevenient Grace falls more in line with Light to the Nations. Holding them in tension makes us stronger theologically. No matter what plan passes or even if nothing changes, the debate will continue. As Christians, it is healthier if we realize that this difference of opinion does not change my duty to love God with all my being and to love my neighbor as myself. It is likely that we differ on a number of issues and are not so disturbed by these other ideas as much. I don't think it is any coincidence that this Sunday's gospel lectionary is Luke 6:27-38. This passage begins with the admonition by Jesus to love your enemies and concludes with Jesus reminding us that the measure we give will be the measure we get back. We must be careful not to let the current polarization that is ongoing both in our country and around the world to overly influence our stance toward one another. I believe that how a church operates with differences of opinion can witness to our nation and to the world on how there can be a better way to get along. This just might be the Way Forward for all of us.